The first heavy rainfall of this monsoon has caused widespread destruction as floods and landslides have obstructed highways and led to casualties and inundation across the country. Due to heavy rains that started on Saturday morning, as many as eight people have died in several parts of the country while water-induced disasters—landslides in the hills and floods in the plains—continue to affect life. At least three people, including an infant, died in a landslide at Saibang, Runtigadi Rural Muni-cipality-5 in Rolpa district on Monday whereas five others died—three in Banke, one each in Kailali and Parsa—due to floods. Nearly 100 houses in Bhajai Municipality and the southeastern part of Kailali district and Dhanewa of Bardaghat, Janakpur of Sarawal, and Pratappur of West Nawalparasi bear the brunt of inundation caused by heavy downpour. According to the Meteorological Forecasting Division of the Department of Hydrology and Meteorology, the threat of such disasters has not ended with rain forecast for the next couple of days. The DoHM on Monday alerted people against an upsurge in water level, which means flood on several rivers. In its daily bulletin, the department warned of rising water levels in major rivers including Kankai, Koshi, Kamala, Bagmati, Narayani, West Rapti, Babai, Karnali and Mahakali on Monday afternoon. Water level may cross the danger level in Mohana, Babai, West Rapti and smaller rivers nearby. Water level reached danger level on two rivers on Monday. When the water level in Riu Khola of Madi valley in Chitwan reached the danger level at 7:30am and downpour continued, the DoHM issued SMSes, warning communities to stay safe. Water crossed the warning level also in Chepang station of Babai river at 11am. When it rained relentlessly, SMSes were sent to communities living along the riverbed to warn them of the danger. In the afternoon, water receded to the warning level in Riu Khola. According to DoHM Director General Rishi Ram Sharma, Babai waters returned to the normal level. “Despite the surge in water level, the situation has not become as frightful as to require immediate rescue,” said DG Sharma. He added that nearly 60,000 SMSes in the Babai area and nearly 10,000 SMSes in Madi Valley were issued on Monday. 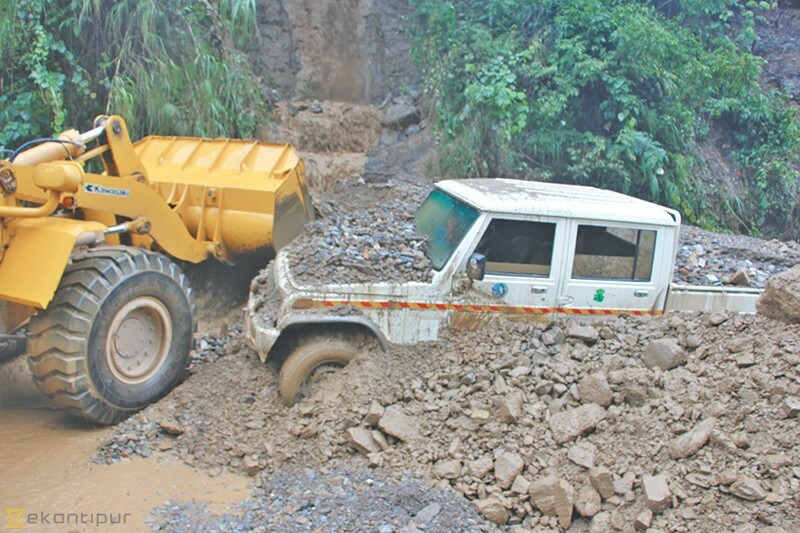 Some of the rivers flowing through central and eastern Nepal such as Mechi, Biring, Ninda, Pathari, Kankai, Budhi Khola, Triyuga, Khado, Lalbakaiya and others of the Chure region threatened to cross the danger level on Monday as rainfall concentrated in the regions. According to meteorologist Barun Poudel, eastern and central regions will see rainfall for the next couple of days while the weather will improve in the western parts on Tuesday. “Heavy rains may occur in eastern and central Nepal as clouds have consolidated over the regions. Western Nepal will get less rainfall from Tuesday,” said Poudel. The monsoon system would get weaker from Wednesday. The MFD has predicted a break in the spell of rainfall from Wednesday, but isolated showers would continue as a normal phenomenon. While downpours are likely in the central and eastern regions, especially in the hills and the Tarai belt, the weather bulletin predicts an upsurge in water level in Koshi, Narayani, Karnali, Mahakali and its rivulets on Tuesday. With rivers originating in the Chure region swollen, flashfloods are likely to occur in Jhapa, Morang, Sunsari, Saptari, Udaypur, Siraha, Sarlahi, Dhanusha, Mahottari and Rautahat districts.